TGIF- F for Friday & Fashion! Yeap, if you already have a lace/kebaya top, all you need is The Excluzif Aurora Skirt and you're good to go and jalan jalan during Hari Raya or any other formal events. There were 5 colours that were featured on the recent blog entry. And I did mention that should you want to choose other colours, do go ahead! Just tell me the colour you would like and I'll try my best to grant your wish! Already granted some of my clients' wishes the past few days! Still waiting for a few more to confirm which colour they'd like. Thanks to my baby girl, I have also received requests from interested mommies who would like to matching-matching with their daughters. Ok so here is a recap on the details. I AM NOT DONE MY SWEETHEARTS! But before that, must give credit to my wonderful sista, Tina for the make up. If you ladies need any make up services for any event (dinner and dance....engagement...wedding...makeover), do contact Tina. She's superb and her prices are reasonable. Let's not only say hello to the weekend....because it's HELLO PONCHOS time too! This colour, I must tell you the story. Me: What about this colour, Nyla? Name it please. Me: Oi don't want la. 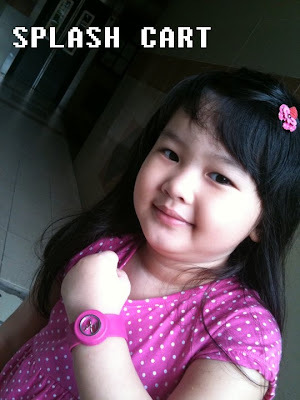 Nyla: Okay you change to Oink Oink Pink. Me: Let's run away from 'pig'. Nyla: Okay. Winnie The Pooh Buddy. So yeah, this one is 'Winnie the Pooh Buddy' Pink. Other than pink, I am also bringing in the family colour which is RED! There you have it my ladies. Absolutely comfortable, stylish, loose fitting (Fits ALL sizes) and versatile, The Excluzif Poncho ($55 a piece) is extremely popular. HAVE AN AWESOME WEEKEND! MWAAAHHHH! Remember the SPLASH CART entry I did about a week ago? If you have missed out on that, do click here! 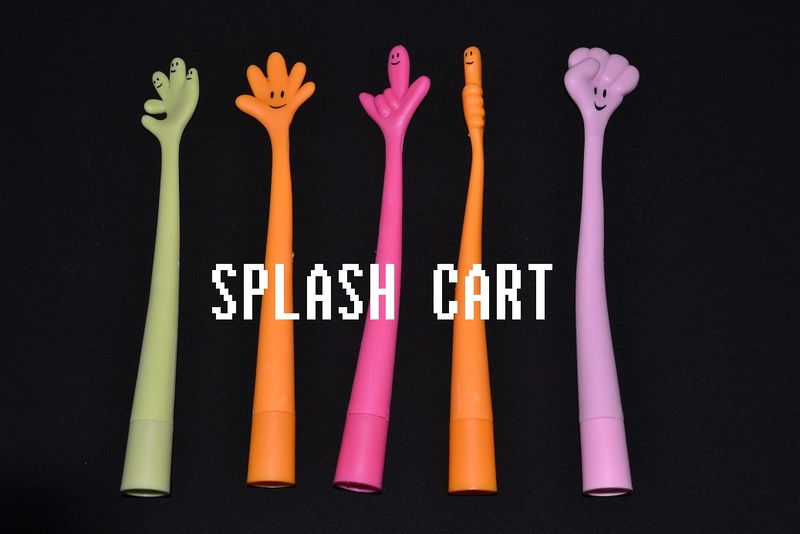 Well, the SPLASH CART team would like to say HUGE THANKS for the overwhelming support, peeps! 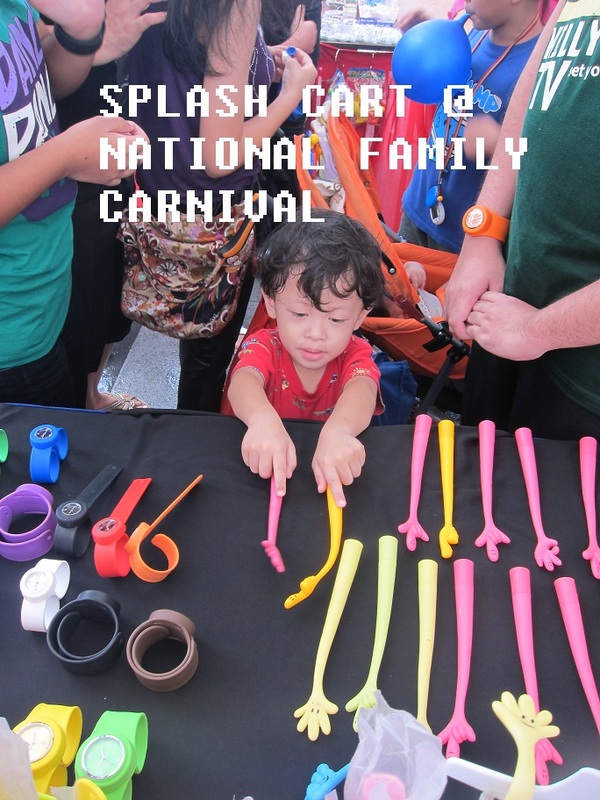 Thank you also to those who came to the National Family Carnival! 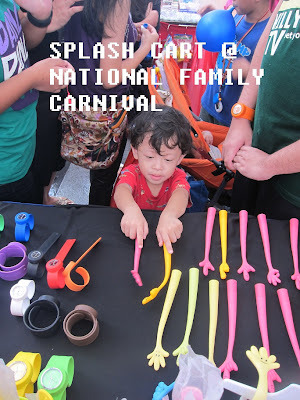 Not only did you came to support the event, you all totally wiped out the booth! 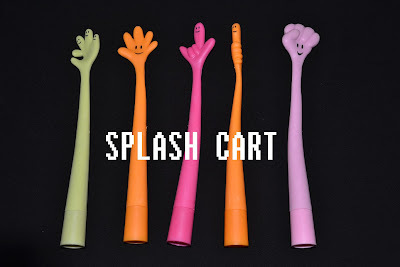 In fact, the Splash Cart team emailed me loads of pics I sooooo must share with my readers because many of the pics are really very cute one. Cute babes... Happy matching those watches with your outfits girlies. Awww. This cutie pie looking so sweet in her pink polka dot dress and her matching pink slap on watch! 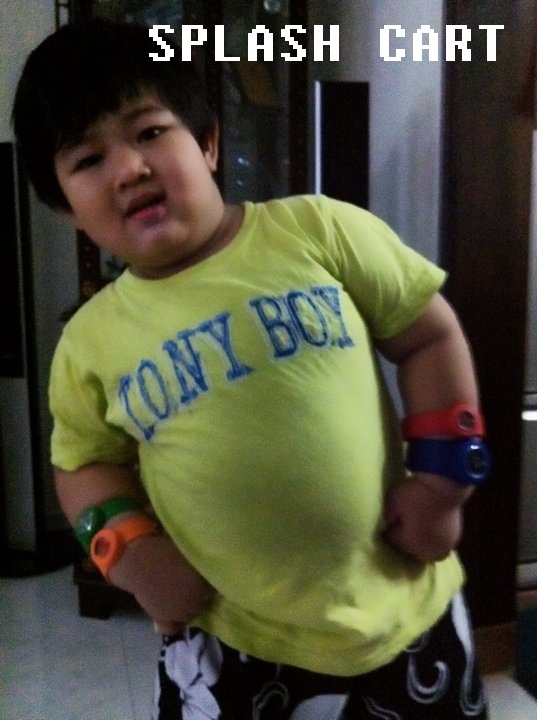 Yeah Handsome boy! Blue FTW! Still baby buchuk can tell time already. Looking real smart there. 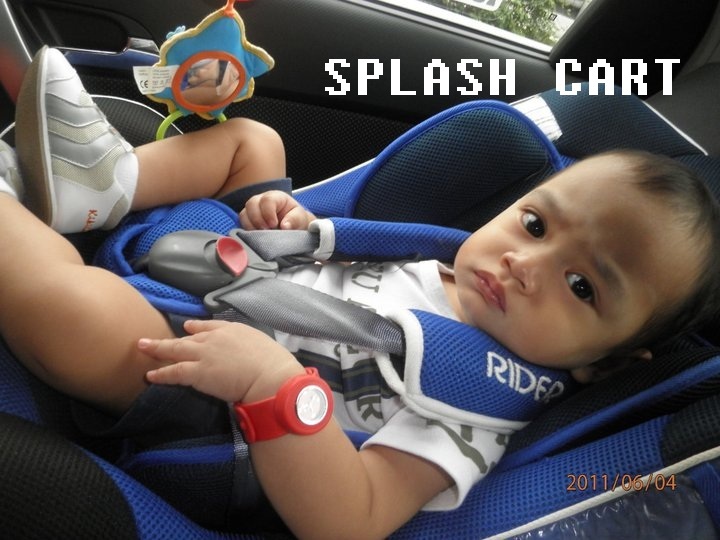 National Day coming, must wear your red watch okay baby! ANAK SIAPA NI? I VERY GERAM CAN? 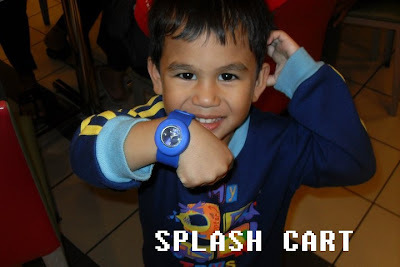 Mr E: Sedap seh if dapat slap on the watches on his tough hands. Yeah man. Adik angkat weights ke? Tooooooo cute la. Ok... 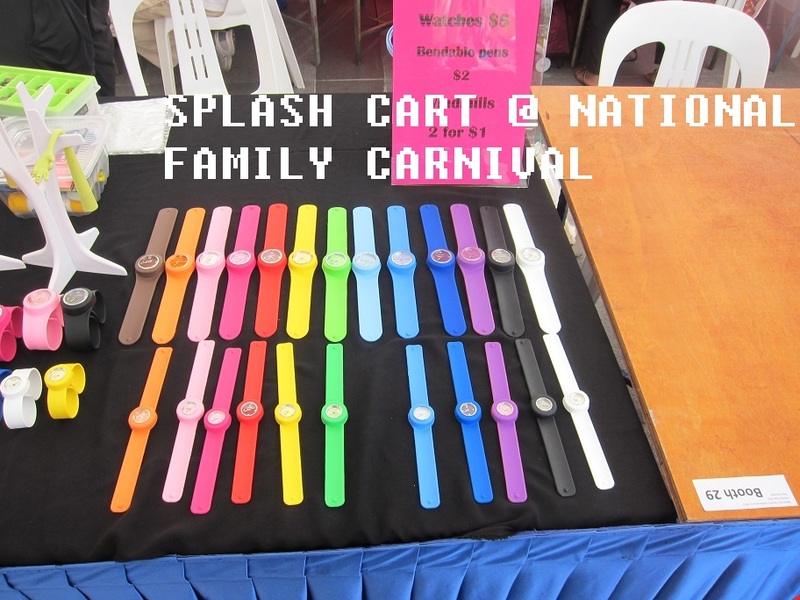 I am sure you all know that these colourful watches are selling at JUST $5 each. 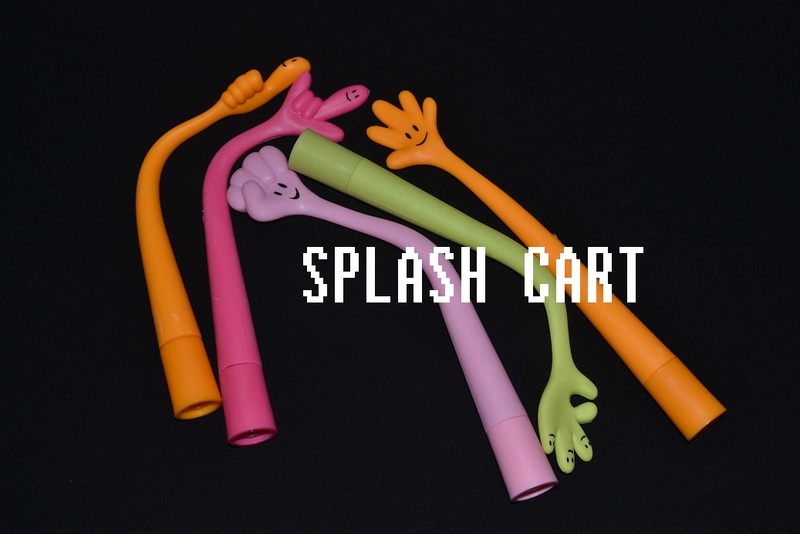 If you think Splash Cart has got only these watches in their cart, uh uh you're wrong. They also happen to have super duper cool bendable pens. Children's Day is just 2 months away. For teachers who would like to purchase the watches for your beloved pupils, Splash Cart is kindly giving a 10% discount. Woots! Really nice to see my girl, Hajar and Faryz (Harlow!) at the event. Hajar ever modelled The Excluzif Togas last year. With the orang kuat, Tina! Yeap she's wearing navy blue Excluzif poncho! Thanks sista for the support. I was just browsing facebook and saw her note she wrote after the event. Yeap, she gave me permission to share this with my readers. When I reached the venue, everything was so smooth sailing I didn't expect the all the drama! Before I can thank anyone, i would want to walk you thru the events that challenged us to the brink of insanity. Some of us went thru hell and back yet maintained composure. When we posted up the poster in FB, within 3 days all the tables were sold. I was happy that the response was overwhelming. Now comes the logistic part. We promised 20 tables to be set up in the Youth Centre and we initially had just enough. Due to unfortunate circumstances, some table were stolen thus Adam, the main coordinator at Ain HQ was stranded. I was rather pushy and insisted we need 20 tables for 20 retailers. Adam said he will find tables for me. While logistics were being arranged, Nadzyrah from the AMF Team who is also in the organizing team reported every now and then of her progressing activities of work done. Her team did the poster for the event, she ran around to go printing, haggle prices, big poster printing, liase with entertainers and do up the agenda. One day before the event ( 23 July ) I learnt that Adam's 14 year old cousin passed away on Friday due to cancer. He pent up his poignant emotion and was rather disoriented. Addition to the misery, the guy who was supposed to send him the tables did not return his calls neither replied to his email after confirming. Amid coping with the death on the very same day - Adam managed to find some ah pek guy who is so willing to give a very discounted price for 15 tables. ( CINA JUGAK YANG SANGGUP TOLONG ) He finally managed to sort out the issue with the tables so just not to disappoint anyone. He did not even tell ME about this until Saturday when i came to help with the table arrangement and he paid the tables with his own pocket money. Misfortune does NOT end there for Adam, the same Saturday nite when i tried calling Adam to ensure he is alright, he refused to answer my call. We exchanged text messages and I learnt that he lost his wallet. Missing a substantial amount of cash, receipts , atm cards, ID and others. He meant to go to his Aunt's place in Marsiling to give her some condolences cash but instead , his other cousins lend him some money so he could go home. It was an extremely challenging day indeed. Today - I checked with Adam, he visited the Doctor due to back problem and made his way slowly for a police report on his missing wallet and ID. Adam - if you are reading this later - PLEASE DO TAKE GOOD CARE OF YOURSELF, Buddy ! Actual Day - 24 July. Hadad and Khairol the two main volunteers who are the backbone of the Youth Centre slept overnite at the centre. I got there just slighly before 9am. The first retailer reported and paid me $60 at 9.10 am sharp. 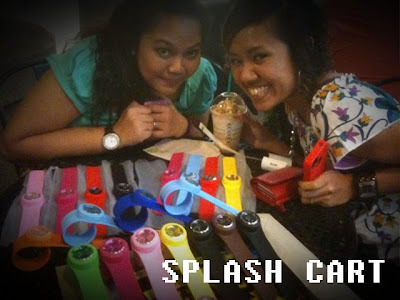 My dear schoolmate friend Malini came in to help me arrange my goods for my table. Then we had a big huge problem. The airconditioner near the stage leaked like crazy. It was dripping endlessly on the parque and i have no idea how to get it fixed. By then Projek Cinta performers are due to perform soon and the floors are still wet!!... Inside I freaked out like no woman can imagine but i tried my best to look as calm as i could. Im the kanchiong spider type and pretty much a perfectionist so.. when hiccups happen, i'm like that lah ! You did such an amazing job. You have such a big heart that I am so proud to have you as a dear friend. According to Douglas M Lawson, "We exist temporarily through what we take but we live forever through what we give." Free tomorrow to see this girl do some storytelling with her mommy? If yes, do come down to BUKIT BATOK EAST GEN Y, AIN SOCIETY YOUTH CENTRE (Blk 235, Bukit Batok East Ave 5 #01-21) TOMORROW for a charity mini market (from 11 a.m. to 6 p.m.) jointly organised by Ain Society and Team Trasformazione. 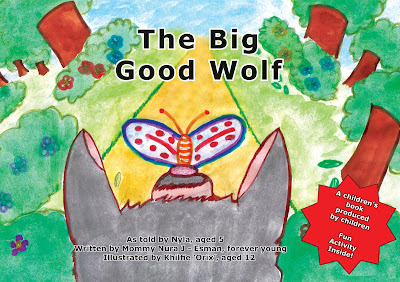 Nyla and I will do our part for charity by bringing in our books. 10% of sales proceeds will go to the organization. On top of that, Nyla and I will also conduct a fun storytelling session together for the children from 2 p.m. till 2.30 p.m! All walks and races are most welcome to attend. Happy shopping....eating...and being entertained tomorrow. Come to think of it...my elder brother, Bah's wedding was where it all FIRST started actually. Sorry you have to tilt your heads ah.... Just wanna be irritating because this picture annoyed the hell out of me by refusing to be edited! Aaaargh! I was looking at my wardrobe and found the 'princess' skirt (That's what my mommy calls it) I wore during my brother's wedding. The skirt my mom painstakingly sewed because yours truly just wanted to look pretty on her brother's wedding. Back view of the skirt. And yeah, you guessed it alright. Another EUREKA moment for me. 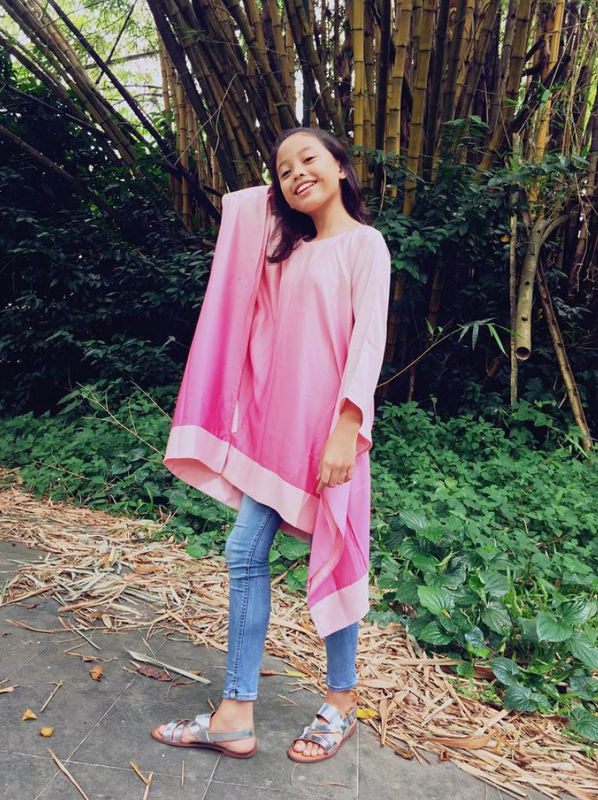 I know I just released The Excluzif Ponchos but really, with Hari Raya coming, my mommy and I felt that our ladies would be thrilled to have us introduce our absolutely elegant soft organza and silky satin Princess Skirts. While we were discussing, Nyla who was eavesdropping the whole time, interrupted and asked if she could name the skirts. "Nyla, don't worry about the colours. More or less settled. I'll just use the colours you suggested before.... " I told her. "No Mommy. I want to name the title of the skirts. They are Princess Skirts right? Can we just name all of them Aurora? She is my favourite Disney Princess." So there you have it, dearies. Wedding- dinner- at- hotel invites? This look is for you. 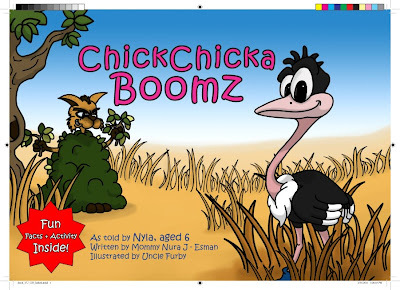 Really proud to be collaborating with CheekyChicas. The pink and gold "Elegante"corsets I'm wearing are from them. Wear hijab also can be stylo mylo hokay! Still have no idea of what to wear during Hari Raya? 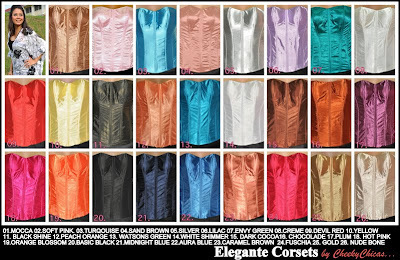 If you already have lace tops, why not match with The Excluzif Aurora Skirts? Give Nyla chance la ah. This year, she is not the model for 'First Girl' leh. The fact that I still model for 'First Lady' upsets her more! So yeah, now that she is modelling The Excluzif Aurora skirts, she's all okay already. My Mr E, you too! Despite the many scripts you had to mark, you came to help me carry all the stuff home. Mwaaaaaaah. My sista Tina, thank you for not only the make up but the styling and art direction too! Hee! Congrats on being selected the choreographer yet again for the second year running for SIM-RMIT Annual Bash/Pageant! You're just awesome. My sew terrific mom and the best business partner one can ever have, all these creations would not have been possible without you. So my ladies, there you have it. PRICE: $77 (INCLUDES REGISTERED MAIL) - Hari Raya Special! Available colours are "Rose" Maroon, "Cotton Candy" Pink, "Crabmeat" Pink, "Midnight" Navy Blue, Star Silver, "Gold Coins" Gold (???! Nyla la! ), "Toothless" Black. See you girlies at my mailbox!